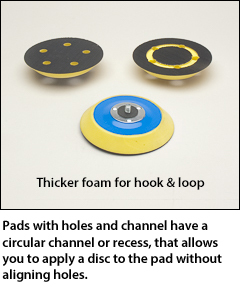 Hook and loop backing pads, thicker foam vinyl pads. 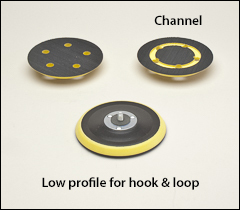 Backing pads with holes and channel have a circular channel or recess, that allows you to apply a disc to the pad without aligning holes. Abrasive discs are shown on our Discs page. SAFETY WARNING: Make sure the maximum RPM of the pad you choose below, is more than the RPM of the power tool you are using. Also make sure the maximum RPM of the disc you are using, is more than the RPM of your power tool. Low profile ½" thick foam pads Use on dual action/random orbital sanders. Fine finish on flat surfaces and moderate conformity to contours and curves. Maximum RPM: 12,000 for all but the 8" diameter which is 4,800 maximum RPM. Tapered edge vinyl pads with a hook and loop face. More flexible pad for curves, contours, and fine finishing. Maximum RPM: 10,000 for all but the 8" diameter which is 4,800 maximum RPM.